By Sari Heidenreich, Contributing WriterSuperior Court candidate Vic Stabile said a statewide media campaign has not been possible but is on select cable and radio throughout the state. Covey said her radio and TV ads began airing last Sunday in various markets.http://youtu.be/_nQQSUqDNd4The ad slams Democrat Kathryn Boockvar for her advocacyof a 2009 bill that would have mandated prisons include voter registration forms in packets given to ex-offenders.It’s about costs, says Covey campaign manager Mike Morris. “By making this a legal requirement, you will trigger compliance costs: Was the voter registration provided? Who provided it?” he wrote in an email. Update: Boockvar’s campaign is highlighting the fiscal note from the bill in question – the go-along with the legislation indicates that it would have come at a $0 cost. [Boockvar] noted that the 2009 House measure would have spent no additional tax dollars to provide the forms. Here’s a fiscal note confirming that the bill wouldn’t have a cost — noting that the Department of Corrections at that time already provided voter-registration forms to released inmates as an agency policy. 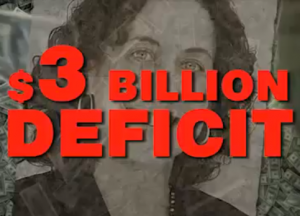 Nearly… here is Jack Panella’s 2009 attack ad against Republican Jane Orie Melvin, and her attack ad against Panella. Here’s Vic Stabile’s 15 second spot. And this is a web video that the PA GOP put together in response to Democratic candidate David Wecht’s $300,000 contribution from the Philadelphia Trial Lawyers Association PAC. Voiceover courtesy of PAGOP spokeswoman Valerie Caras. How could provide voter registration information to facilitate criminals voting have no cost? There are, obviously, printing costs and administrative costs unless the fact that the Bureau of Prisoners is already doing it means no additional costs in which case why is the legislation necessary unless it the Democrats’ way of reaching out to criminals for votes. so why was the law necessary? to give Kathryn Boockvar a chance to write an op-ed to pander to criminals and the elitist liberals who encourage them. Republicans reach out to taxpayers; Democrats reach out to criminals. A Clear Choice on 8 November.